What a mess. So many questions, and so little transparency in this nutty, high-visibility case. Chicago Mayor Rahm Emanuel and Police Superintendent Eddie Johnson were understandably furious about the outcome. “Where’s the accountability in the system? You cannot have, because of a person’s position, one set of rules applies to them and another set of rules apply to everyone else,” steamedEmanuel. According to the reports, Smollett enlisted the help of two brothers, Abimbola Asundairo and Alabinjo Asundairo, to carry out the attack against him. The Asundairos are both black males. According to the indictment, Smollett alleged that one of his attackers was a white male (not true), that the white male wore a ski mask, and that as they beat him, they poured a liquid onto him and put a rope around his neck and pulled him by the rope. How the police figured out who the Asundairos were is not clear from the police reports, but it likely happened because of the extensive video surveillance police reviewed from hotels, stores, and street cameras. Police eventually identified and spoke with the Asundairos, who told police about the wild scheme. 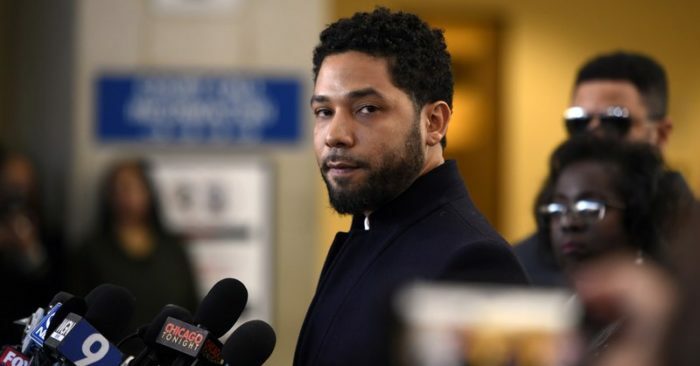 They said that Smollett gave them a check for $3,500 on Jan. 27, and that he also gave them a $100 bill on Jan. 25, which they used to purchase the rope, gloves, face masks, a red hat, and other items. They told police about the bleach. Police had recovered a bottle of El Yucateco Hot Sauce on Feb. 7 near the location of 406 North New Street, which the Asundairos later confirmed was the bottle they filled with bleach and poured on Smollett. Police obtained photos of Smollett’s car and showed the Asundarios the photos. They admitted that the car in the photo was the same car Smollett drove them in on two separate occasions right before the assault.